Since I’ve been on the road in January I haven’t been able to post until today. Regretfully weather issues kept me away from the National Arboretum in the District of Columbia, as well as the U.S. Botanic Garden near the Capitol Building. In fact we arrived in D.C. the night before extreme cold temperatures and snow shut down both the Federal Government and much of the city the following morning. Later in the month, in Raleigh and Wilmington N.C., we encountered similar problems. 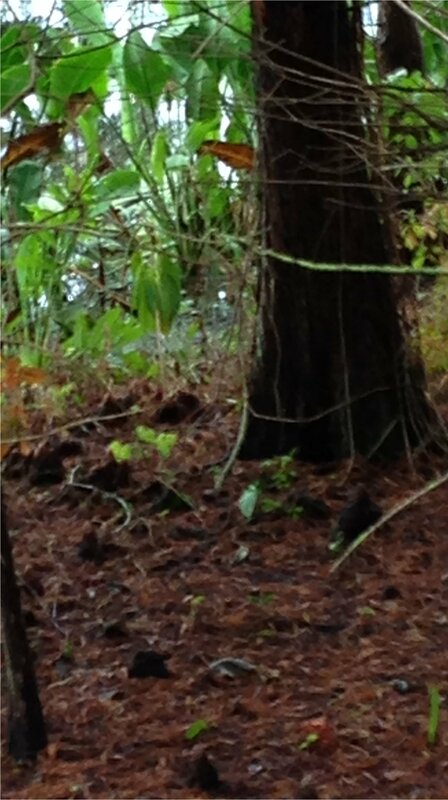 However, in a municipal park in Wilmington we stumbled on these funny Hobbit-like protuberances at the base of Cypress trees near the man-made lake. A local photographer on assignment in the park explained that the locals claim that these little “knees” provide the Cypress trees added oxygen to help the submerged roots. Turns out this is a widely held belief, but not at all warranted. More on that when I have a chance to update this post. 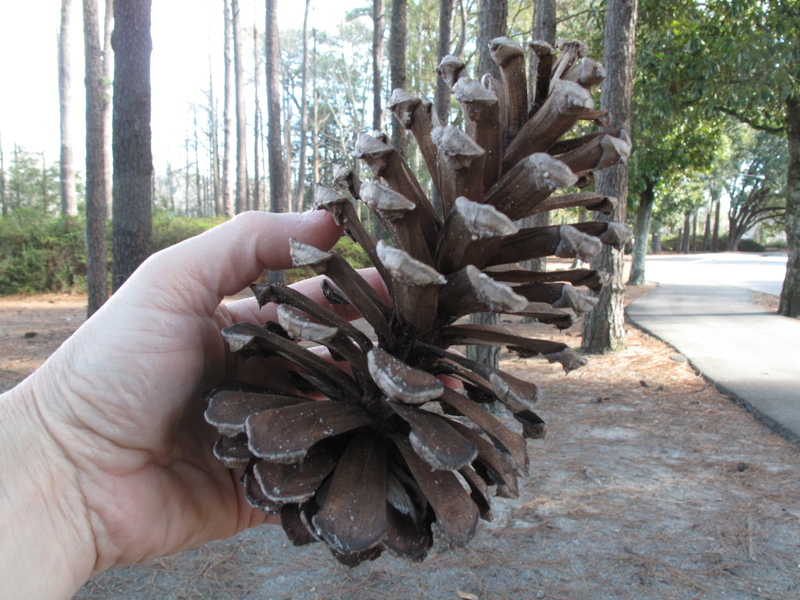 The local pine tree cones in the park were huge and I couldn’t resist taking one home to the Pacific Northwest. As I write, the airport in Raleigh is struggling to recover from the ice and snow, temperatures are about 17 degrees Fahrenheit. We’re hoping our flight to Florida will leave on time. A few days later in Florida we encountered more “knees” at the Green Cay Nature Center in the city of Boynton Beach, which was not surprising considering the Bald Cypress (Taxodium distichum) is found along the coastal plain from southern Delaware to southern Florida, west to southeastern Texas, and inland along the Mississippi Valley as far north as Southern Illinois and Indiana. Nevertheless, it brought to mind the phenomenon of learning of a new word and then encountering it in speech and conversation everywhere you turn. Now for the enigma of the knees. It seems that oxygenation (the aeration hypothesis) is just one of many hypotheses for the function of these little tree bumps: Vegetative reproduction, mechanical support, methane emissions, nutrient accumulation and carbohydrate storage have all been proposed, but none are definitive. Christopher H. Briand, writing in Arnoldia, the quarterly magazine of the Arnold Arboretum at Harvard, explored all the above hypotheses and concluded the function of the knees is still a mystery. 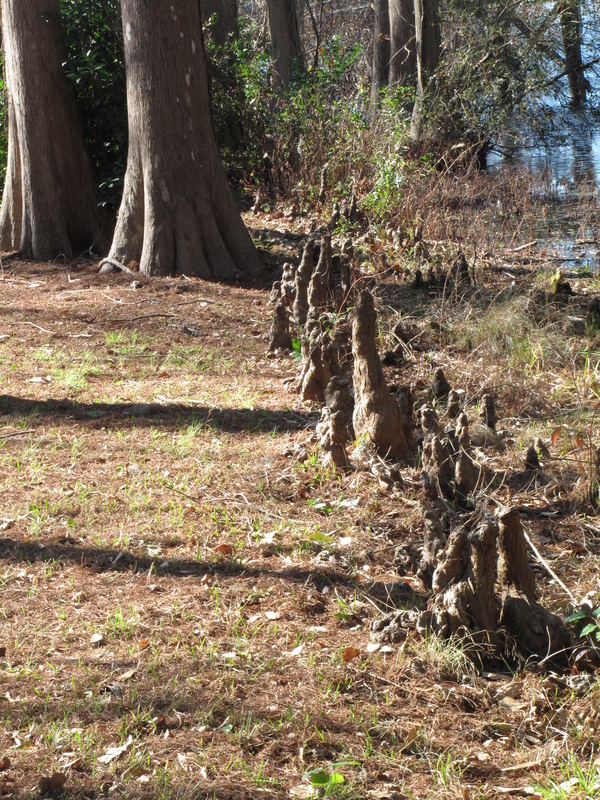 You can read his findings by downloading a PDF of the article, Cypress Knees: An Enduring Enigma. This entry was posted in Travels and tagged Cypress knees by Bart Arenson. Bookmark the permalink.